Stock Drive Products/Sterling Instrument, a leader in comprehensive mechanical solutions for a wide variety of product applications has expanded their product offering with the introduction of a new series of Plastic Cam Followers. Cam Followers using plastic composite rollers are a maintenance-free alternative to traditional metal designs, providing cost-saving benefits. Combining a Stainless Steel shaft and plastic-composite roller these Cam Followers are designed to transmit motion in today's high-speed and light-duty machines in medical, packaging, and semi-conductor equipment. "The plastic roller makes these Cam Followers the best choice for many applications, including food processing or cleanroom operations", says Cris Ioanitescu, SDP/SI Applications Engineering Manager. "Two possible sources of contamination – excess grease and metal particulates due to metal-on-metal contact are eliminated due to the self-lubricating material of the roller. Additionally, the softer plastic roller does not wear the metal cam or rail it is running on. The savings of not having to replace these parts could be substantial." A direct replacement for metal cam followers, the Plastic Cam Followers are lube-free and quiet running due to shock and vibration absorbing capabilities. Series S7NSRY-... are offered in a range of sizes, 5/8" up to 2-1/2" O.D. and can be purchased at the SDP/SI E-store. Other materials and customized design are available to meet client's requirements. SDP/SI, ISO 9001 + AS9100 certified, provides complete mechanical engineered solutions and services which include design, prototype, testing and manufacturing. 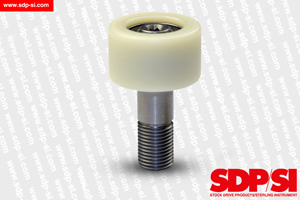 Visit the newly redesigned website at https://www.sdp-si.com to learn more about SDP/SI, their full range of products and capabilities.